Safe on chrome, alloy, clear coated, polished, anodized, stainless steel, etc. 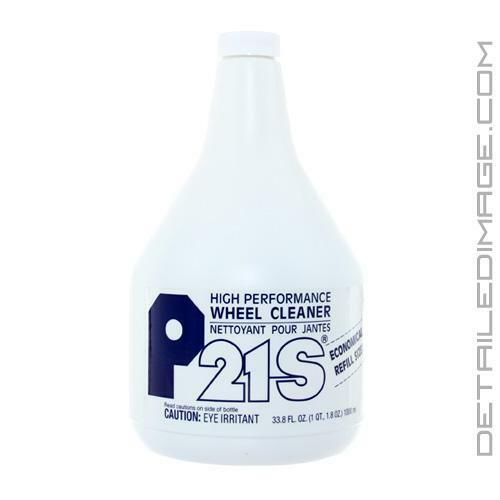 The P21S Wheel Cleaner specializes in delivering a thorough cleaning with it's non-corrosive formula. Many disappointed auto enthusiasts have used wheel cleaners that were too strong which faded or stained their wheels. P21S utilizes a pH neutral formula that is safe on all finishes such as chrome, alloy, clear coated, polished, anodized, stainless steel, etc. Using the P21S Wheel Cleaner alleviates all those fears while still providing a high quality cleaning formula. Spray it on your wheels wait 1 - 2 minutes and a steady stream of water will remove the majority of contaminants. Re-spray and agitate stubborn build ups with a soft cloth or sponge and your wheels should look top notch. It will rinse clean and you don't have to worry about harming your rubber tires or the driveway. The 1000ml and 5000ml bottles are considered a refill size by the manufacturer and it does not come with a trigger. The 500ml Kit comes with a trigger and a foam sponge to help you clean. Pick up this highly effective formula that is also completely safe! Insure wheels are cool, if not cool with water. Spray fine mist of P21S over entire wheel. No waiting time is required. Rinse with sharp jet of water from hose turned on full. I've been using the P21 Gel for years and ordered the non-gel by mistake. I'm happy with the results and most importantly for me is never worrying about an issue with P21 on any wheels. Great product easy to use. Gives a clean brand new finish on my wheels that last. I will be using this product from now on.Thanks detailed image for having another great product to buy. Works great! Used it to remove dirt and grime off my wheels that he been caked on for over a year. Took a while to work but it works better than any other producte I've tried from local stores. I will be using this product from now on. Easy to use!